The LaserJet 5200N printer is a business-class 11"x17"-capable printer. This printer is fast (35 pages per minute) and includes an Ethernet port for connecting to a network. Has 1 standard 250-sheet tray, and a 100-sheet bypass tray. The laserjet 5200N is the third printer in the 5x00 series of printers, its predecessors were the Laserjet 5000 and 5100 series. These are all 11x17 capable printers, the 5200 is the newest and fastest of the series. The 5200N includes a built in network interface. 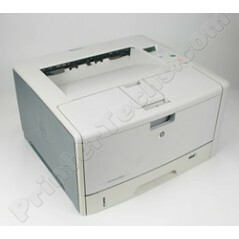 Other models in the laserjet 5200 series include the 5200 (Q7543A) which doesn't contain the network connection, 5200TN (Q7545A) which includes networking and an extra tray, and the 5200DTN (Q7546A) which includes duplexer, networking, and extra tray.